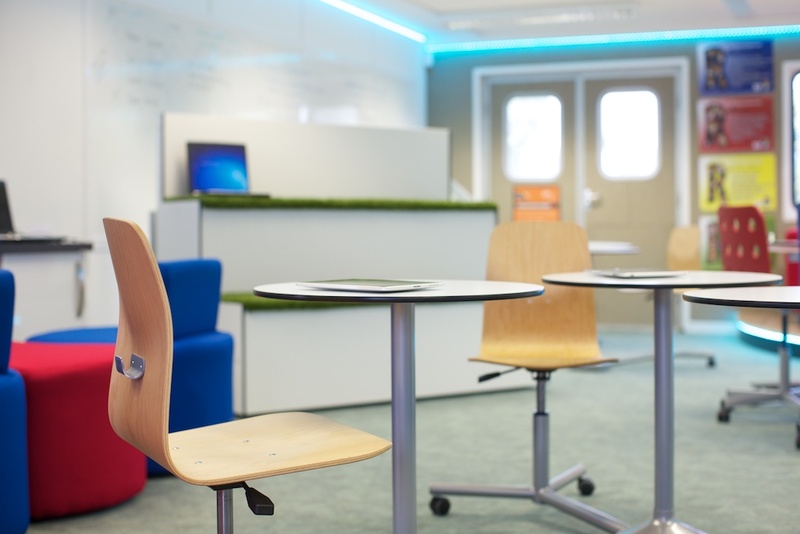 lately Stephen has been working with Dulux supporting their excellent Smarter Spaces initiative - there are many useful links emerging from that project. For example their toolkit in support of funding initiatives, or their project plannigng pages with a few links to more research, or lots of examples on their blog. Back in the last millennium there was a lot of talk about the direct impact of colour on school behaviour. Some teaching colleges had little sections on it in their curriculum. The orthodoxy embraced claims such as that eau de nil was calming, whereas orange would cause disruptive behaviours. No it isn't / doesn't, but the truth is, as ever with learning, complex. 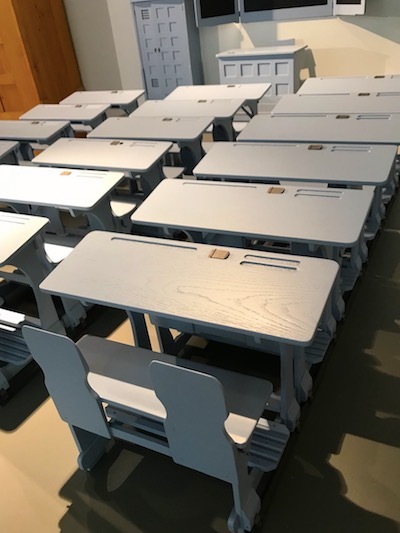 One thing impacts on another: in the 1930s some classroom furniture was painted light blue (below) to discourage insects (!) from distracting the children, but in the 1930s a lot of open windows and inside / outside learning spaces were created so that insects were, perhaps, more of a challenge. Colour carries multiple functions. Some examples: it can carry social symbolism - red stop lights; colour can be functional - yellow has the widest peripheral vision - so thus propellor blade tips for safety; or it might be political - many countries have a Green Party in their politics; colour can be biological - blushing red, or patterns on snakes. The combination of all this makes the impact of colour within learning complex. Dulux have a good checklist on their Smart Spaces website which is a good starting point. Everyday evidence: the red sofas on the BBC Breakfast set - because red allegedly catches your attention, especially in the morning; or the French abandoning yellow headlights because they didn't deliver on safety - is all around us. And a quick search of research journal databases reveals any number of research papers about red lipstick, green cars, blue morpho butterflies and the like - but not much of this is practically applicable to your learning space. 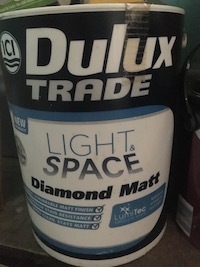 In the UK Dulux manufacter their LumiTec product as Light and Space - it is sold in most DIY stores, or through trade outlets. As an aside, in my home I have used it on the stairwell and attic playroom to dramatically improve light levels. Light levels are enormously important in learning spaces. Our little Internet of Things device, the Learnometer, has been measuring light levels and much more in learning spaces and has shocked us as we have seen how poor the light levels are in so many learning spaces. 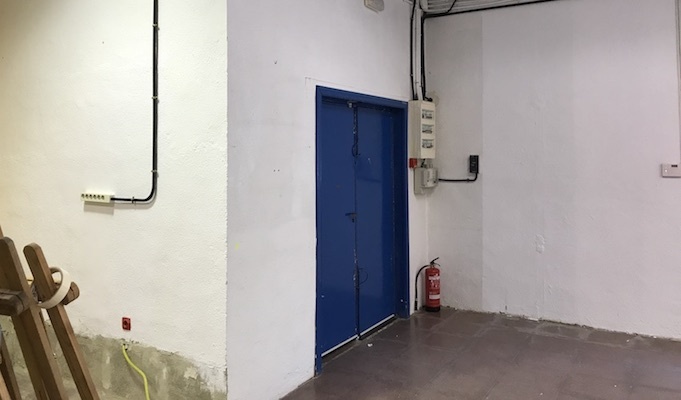 With often more than 10,000 lux outside, retaining the minimum for good learning of >500 lux shouldn't be too much of a challenge - but we have found very many learning spaces - and examination rooms - way below that level - damagingly so where learning is concerned. Typically, light is damaged by walls that are too dark or densely coloured, ceiling tiles that have faded and yellowed over the years, paper stuck all over the windows, a too dark floor surface and desks (in old style spaces where there are still a lot of desk surfaces) that don't reflect light upwards. Poor lights - often with many turned off to save energy - can be transformed by a direct exchange of bulbs or tube for LED ones - not cheap but they last forever. If you do buy LED lights, go for the pure white ones, not the "soft cream" or "blue tinge" ones. A good rule maybe is to use LumiTec white, or maybe their slightly tinted colours, on walls if you have any doubts about your lux levels (remember you are aiming for at least 500 lux or better). Colour is wonderful for signification: zoning, routeways, highlighting, demarkation... Bright colours can be uplifting and fresh.Think how you can keep colour refreshed. If you are trying to match paint and fabric (for example for a green screen and matching "cloaking sheet") then buy the fabic first and have paint mixed to match it - you can't do it the other way round. Get everything off your glass - no paper please - but you can use glass writer pens on the windows without damaging incoming light very much. I'd recommends the Edding 4090 pens, but only buy the fluo colours - the dull colours get lost into the background. If you want to explore the overall impact of colour on mood, perhaps go for mood lighting through controllable, multicolour LED strips - and change their colours during the day. They are usually a sale item after Christmas. And remember that most of this works in corporate and home learning spaces - perhaps espeically teenage homework spaces - too. Enjoy.